I swore I would never use a keyboard with an 8” tablet, but I must have had my fingers crossed behind my back. 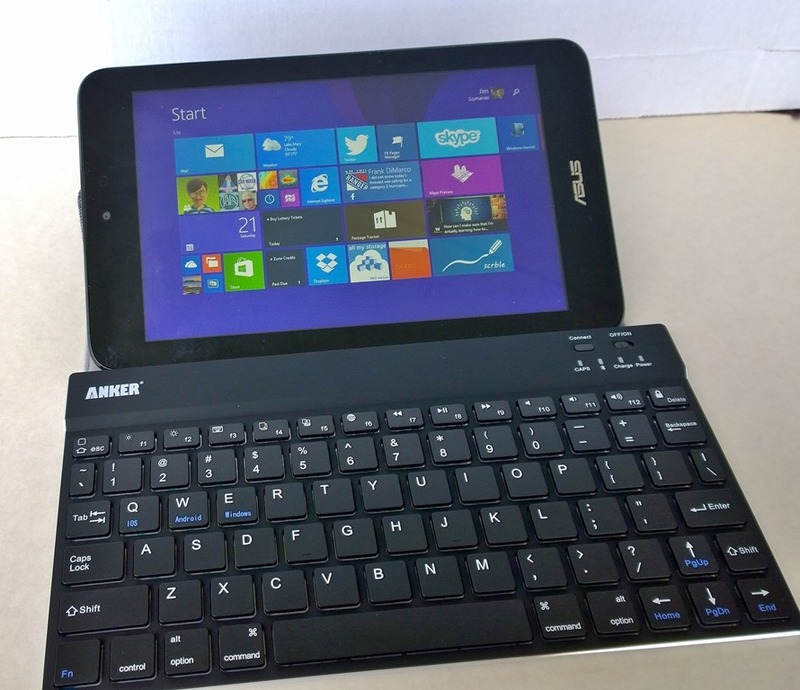 While I used my Acer, and now my Asus 8” tablet mostly for consumption, and an occasional email reply or a FB post, there have been times where I would have liked to have an external keyboard. Unlike my phone keyboard, I find the on-screen keyboard difficult to use. It consumes half the screen in landscape, and in portrait it’s simply not easy to hold the tablet and type at the same time. Filling out info on webforms, or posting on a blog are especially difficult as the on-screen keyboard typically covers the area you are typing. So you are basically typing blind. My criteria for a BT keyboard were not that critical. it had to be cheap, as I might only be using it occasionally. It had to be roughly the same size as my 8” tablet for uniformity and storage. And it had to be black (that while stuff it too iLike). I looked at the foldables and remembered how much I didn’t like them back in my Pocket PC days. 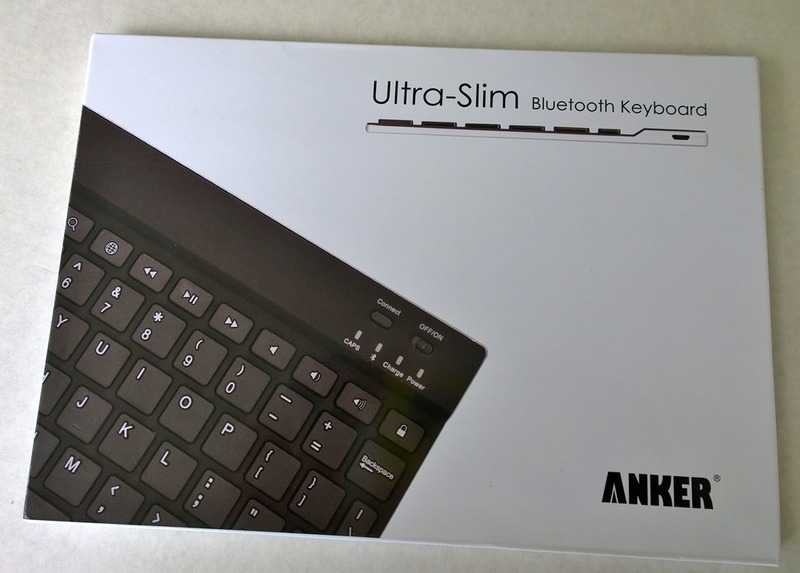 I settled on the Anker T320 Ultra-Slim BT Keyboard. Anker makes several different size BT keyboards. The T320 is the same width (5.12”) and about 3/4” longer (9.45”) than my Asus Note 8. 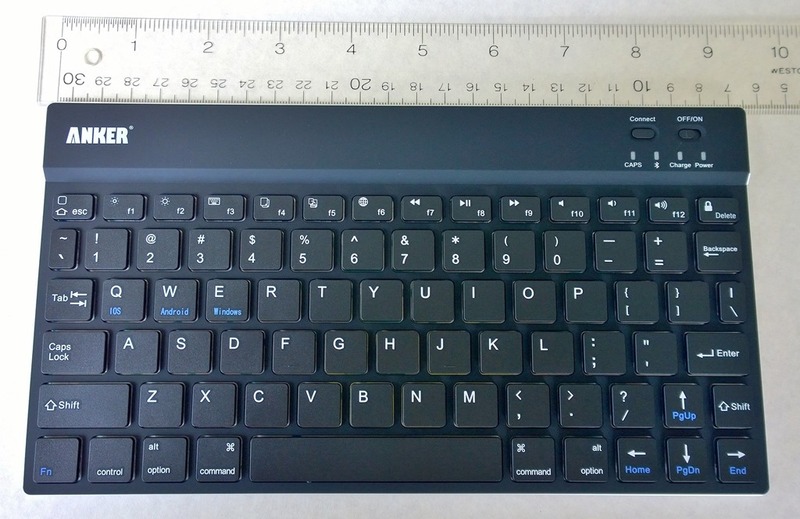 Except for a little bump at the top, the rest of the keyboard is less than 0.25” thick. It has a full six rows of keys, including function keys, in a compact format. I don’t mind the smaller keyboard as I am a 4 finger typist. I simply peck on whatever is in front of me. Setup was brilliantly easy. Switch the easy to access power switch to on, press the connect button and pair your device. You have to type a six character key to complete the pairing. Reviews said the keyboard will go to sleep after 8 minutes, although the documentation states 15 minutes. Either is fine with me, as long as it’s not under 1 minute like some portable BT keyboards. Anker claims 30 days of standby and 140 hours of use per charge with their 280mAh rechargeable battery. I would be happy with half of that in the real world, but more is always better. The T320 comes with a micro-USB cable, but no charging block. Not an issue as I already have two micro-USB charging stations in the house. 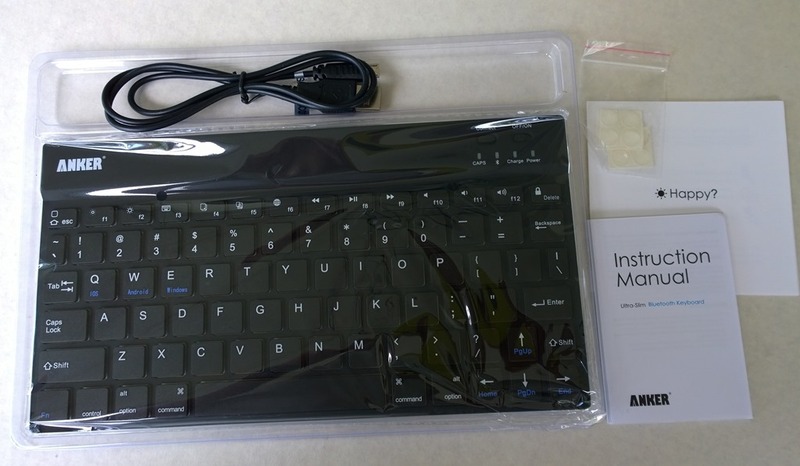 The keyboard is designed to work with Android, iOS and Windows devices. Special function keys can be activated using the Function: Q, W or E combination, for the respective OS. There are 4 indicator lights for; power, charging, BT connectivity & caps lock. The power and BT lights turn off after a few seconds of activation. The charge light remains on when plugged in till charging is complete. The CAP LOCK key remains illuminated when active. Good way to check if the keyboard is on, or has a charge. The keys, as I tried to capture in one image, have a lot of travel, and feel good under the fingers. I may try to find a small pouch for the T320 so as not to bend or knock off any keys when slipping in or out of my gadget bag. The keyboard has only been unpacked for a few hours but my initial impressions are positive. Not bad for $25.99 and free Prime shipping from Amazon. And just like the President of the Hair Club for Men, I created this entire post with my ASUS Note 8 and Anker T320 keyboard. I wouldn’t recommend this combo for posting though. Not with a perfectly capable i7 desktop, 25” monitor, full size keyboard, wireless mouse and comfy chair mere inches away. But at least now I can say, “I can”, if asked. CAUTIONARY NOTE: While typing this I experienced multiple duplicate entries on various keys. As this didn’t happen with my initial Notepad testing, not sure if this is a Live Writer issue (just installed it on the tablet) or something more serious, like a lemon. Tried moving closer, further away. Pressing lighter, harder. Typing faster, slower. Results were about the same. I will update this post either way though. UPDATE: After multiple tests it’s clear that the keyboard shipped to me creates double strikes when you try to type at any speed beyond very slow. I contacted Anker Customer Support and they have been very responsive. We tried a couple things like charging the keyboard overnight and turning off WiFi while using Bluetooth, but the problem has persisted. A replacement keyboard is on it’s way to me. I have also been advised if the replacement has the same issue I will get a refund. Can’t complain about that. Next articleWindows Losing The Tablet Wars? Hello Jim, I too had the same multiple/duplicate entries issue with my Anker. Its still pretty handy and I think I can deal with it but yeah, its a flaw for sure.